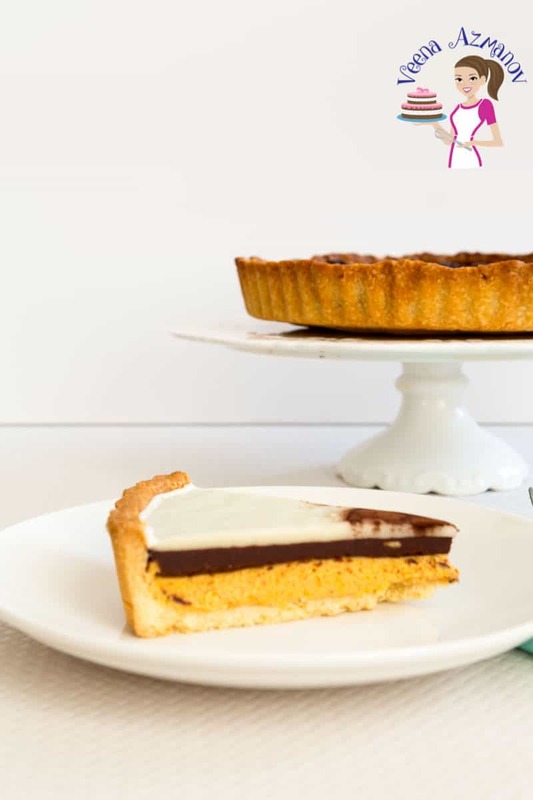 Celebrate the season of fall with something different for Thanksgiving with this triple chocolate pumpkin tart. Three layers of chocolate, a whipped white chocolate pumpkin layer in a buttery crust baked to perfection. Whether you bake it from scratch or semi-homemade, this is going to be your favorite dessert this year. Have you started to see pumpkins everywhere around you yet? Well, we still have a few warm days ahead of us so I’m not complaining. But we have started to see a lot of pumpkin coming into the markets and these have been tempting me to make some pumpkin inspired recipes. Last week I made a delicious cheese pumpkin souffle and the kids really enjoyed it very much. I made this triple chocolate pumpkin tart to celebrate the Jewish new year Rosh Ha Shana and guess what? No one believed there was pumpkin in there. The loved the tart but the pumpkin was not so strong in flavor. The only thing that gave it away was the lovely orange color in the bottom layer. 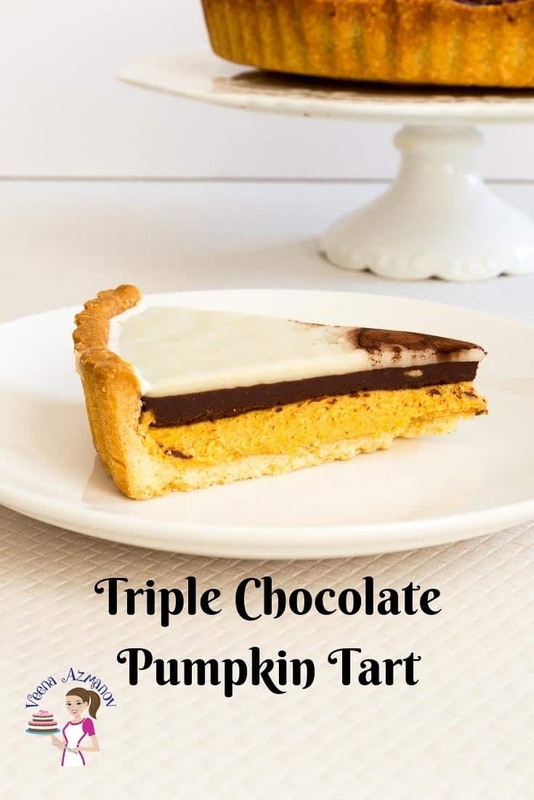 If you love the combination of chocolate and pumpkin then this one is for you. In fact, if you love white chocolate then this one is definitely for you. Personally, I am a dark chocolate person so the white chocolate on its own would be a tad bit sweet for me. But I used a 70% dark chocolate for the second layer that cut down on the sweetness. Pumpkin puree – I like to make pumpkin puree at home so today I used my homemade pumpkin puree. I like to roast the pumpkin in the oven until soft then pulse and sieve it thru a mesh. A bit of work but the flavor that you get from the roast pumpkin does take any dessert to the next level. But you can use canned pumpkin puree. White chocolate – yes, white chocolate is sweet and rich and works really well with the pumpkin. 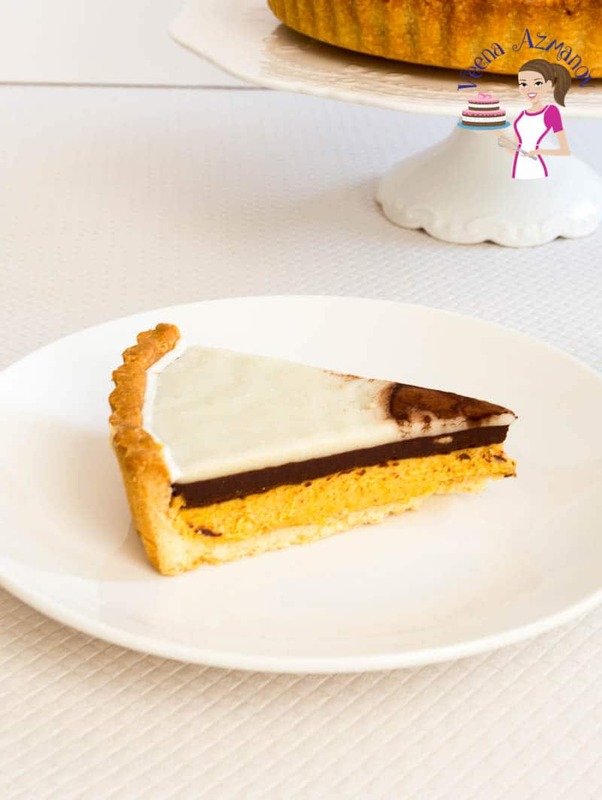 Dark Chocolate – You can play with the percentage of the dark chocolate based on how sweet you want this tart. I used dark chocolate at 70% this time. The first time I made it, I used 90% cocoa and the kids didn’t quite like the second layer but the 70% worked just right for us all this time. 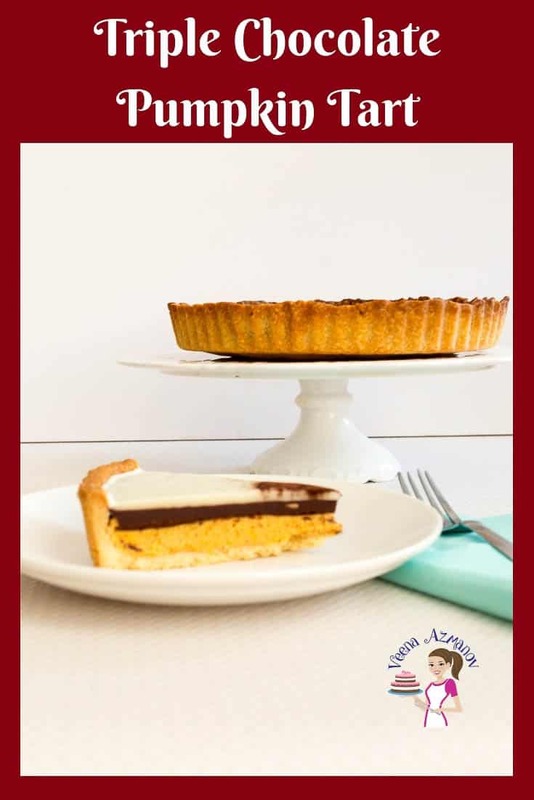 Ganache – Well, I do have a detailed video and recipe on how to make ganache so I prefer you watch those videos before you make both these ganache recipes. 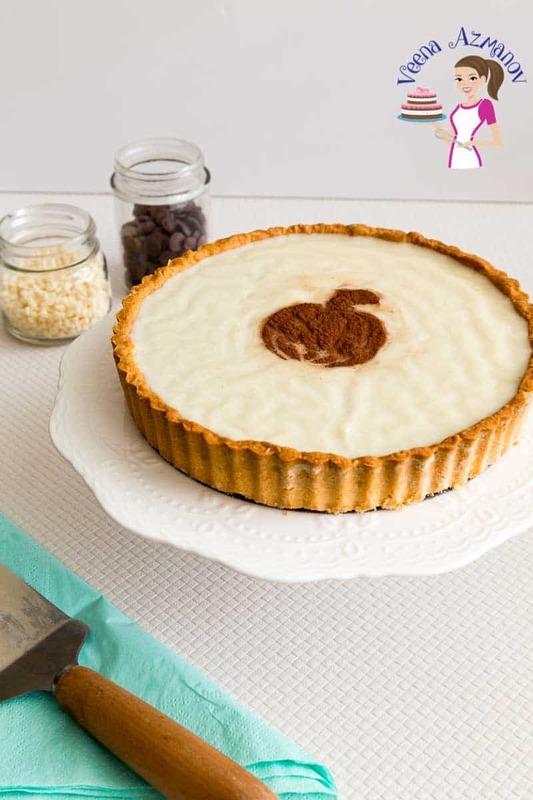 Shortcrust pastry – Like I said below you can use my step by step recipe and pictures in my post – shortcrust pastry 101 – which is very detailed and will ensure you make the best shortcrust pastry or you can use a commercial ready to roll storebought pastry as well. If you buy then make sure you bake the pastry fully as directed on the instructions. How do I make this semi-homemade? The only real work you do on this dessert is the pastry crust which can be made ahead of time. I always make mine from scratch and yes, I am very passionate about making these from scratch as you can tell from my detailed and passionate post on Pie Crust 101 and Shortcrust Pastry 101. But if you are short on time. Guess what? The supermarket has tons of ready to roll shortcrust pastry as well as prebaked shortcrust or cookie crust tarts which can be used to make the fillings. So there is no need to stress over this dessert last minute. You can use canned pumpkin puree as well. But whatever you do, use good quality chocolate – you can thank me later. Use a ready to roll shortcrust pastry from the supermarket for a quick semi-homemade recipe. When chilled whip the ganache until light and fluffy. Spread it evenly in the fully baked and cooled shortcrust pastry base. Cool for at least an hour or more. Prepare one batch of dark chocolate ganache when the first layer is chilled. Pour it over the first layer. Chill until set an hour or more. Chill again for at least two hours or more. You can just sprinkle some cocoa powder on the edges of the white chocolate surface for a quick job. Simply place the stencil as shown in the video and dust with cocoa powder. Carefully remove the stencil and voila! 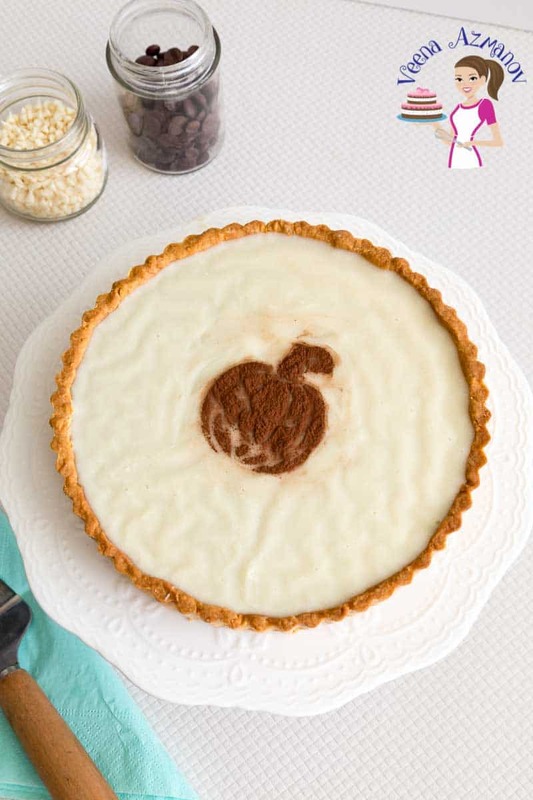 You have a stencil design of a pumpkin on top of your chocolate pumpkin tart. Wonder where you can use this delicious Perfect Homemade Sweet Shortcrust Pastry? Well, you know I love baking and sharing my recipes with you. 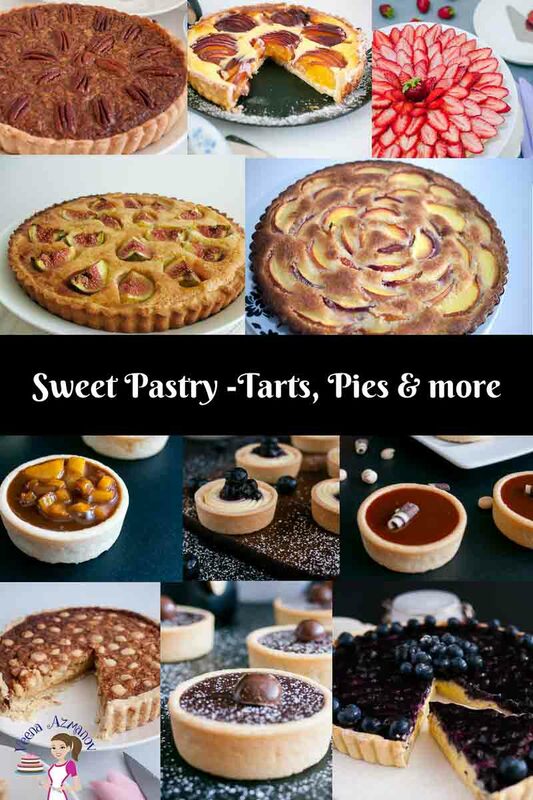 Click here to see a list of my Sweet Pastry Recipes – Tart, Pies and more. Alternatively check out my Recipe Index to see a list of all available recipes on this blog. A collection of Sweet Pastry Recipes for Tarts, Pies, and More. Made this tart, this weekend. So delicious. NO one believed it had pumpkin. Thank you, Victoria. So happy to hear you enjoyed this recipe so much. Thank you so much for coming back to write this feedback. Appreciate it very much. This is just the type of dessert that we love. It’s a real show-stopper! I can almost taste how smooth and creamy it is and I know our family would really enjoy it. This has got to be one of the desserts I make for Thanksgiving. Thanks, Marisa. I think you will enjoy these. Your creations always look and sound so delicious! I love that you make your own pumpkin puree. I will definitely have to try that! Thanks, Denise. Yes, I always make my own pumpkin puree. It’s so easy. I’m a big fan of white chocolate so this is definitely the dessert for me. I’d never think to pair it with pumpkin though…yum! The stencilling looks fun too, I’d love to learn that. I’m actually not a big fan of white chocolate but this one we really enjoyed. This is the best chocolate pumpkin tart I ever made. I used your chocolate shortcrust pasty instead and it was so good. Thank you, Hugh. So happy that this recipe worked well for you and you enjoyed it. Thank you so much for coming back to write this feedback. Love to hear from those who tried my recipe. This looks so fancy and delicious! I love pumpkin and I think the layers of traditional and white chocolate really set this recipe apart. Thank you Jenni. I love pumpkin too. This is both pumpkin chocolate lovers treat, love ganache, white chocolate ,dark and pumpkin in one bite. I need to give it a try. Absolutely Swathi. I hope you try this. Thanks Tammy, Yes, I think you will enjoy this one. What a beautiful dessert — it would be perfect for Thanksgiving. I’m a pumpkin fanatic but there are a few in our family who will eat but they’re not as crazy about it as I am. I bet they would love this tart. Oh!! The chocolate on top is ideal!! I can see why your kiddos loved it. I know what you mean Marisa. I love pumpkin too but there are a few who have their reasons. This works a treat. 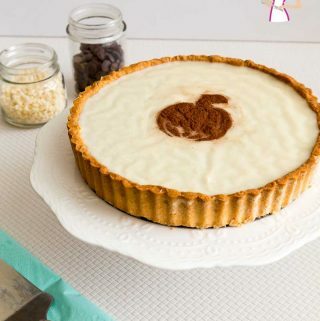 This Pumpkin Tart really looks incredible! This is a great dessert for me and my family. I bet those flavors are amazing! Cannot wait to try this! Love! Thank you for sharing this great recipe. Thanks, Natalie. I wish you were closer,so I could share it with you. Now, this is dessert is right up my alley. I am such a pumpkin fanatic. I can never get enough and actually use it all year long in recipes. What a great dessert to entertain with. Thanks, Gloria. I use pumpkin all year too. Glad you like this dessert. Definitely one to entertain. This is such a decadent dessert I just love the layers and it really is a creative pretty dessert to serve! Thanks, Claudia. Me too, love layers.